Brown ground beef and drain. Press, draining beef to remove excess fat. After draining ground beef, continue cooking for 15 minutes. Add diced onions and cook until onions are tender. Add seasonings and mix well. Add soup and mix well. Continue heating until desired temperature is reached. Heat to 160 degrees F or higher for 15 seconds at the completion of the cooking process. Cook potato nuggets according to package directions or until lightly brown. 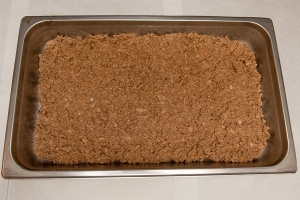 Measure 2 quarts and 2 cups of ground beef mixture and pour into each 2 inch full-size steamtable pan. 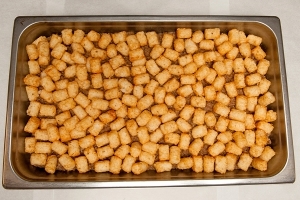 Cover meat with tater tots. 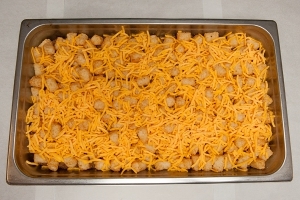 Evenly distribute 4 cups of shredded cheese over each pan of meat mixture. Cover with pan liner (saran wrap and aluminum foil will cause product to sweat and become soggy) and place in warmer until serving time. Cheese will melt while in warmer. Portion with 6 ounce spoodle or ladle for ¾ cup serving to provide 2 oz. eq. meat/meat alternate and ½ cup starchy vegetable. Hold and maintain product at a minimum temperature of 135 degrees F. Check temperature every 30 minutes. Leftovers should be covered, labeled, and dated. Quick chill within 6 hours to 41 degrees F. or lower.